LAM 360° (Land Art Mongolia | acronym LAM) is a biennial art festival located in Mongolia. LAM focuses on Land Art as a form of spatial visualization of the relations between nature, culture and social policies. It strongly promotes freedom of expression in joining people and institutions from all sectors of Mongolian society by meshing their respective backgrounds and perspectives through collaboration and networking actions of regional and global scope. By doing so, the organisation would like to incite an advanced discourse on cultural and social policy which will take up environmental and social sustainability with a strong emphasis on the most vulnerable sectors of society in Mongolia (such as: nomadic people | ethnic minorities | non-commercial cultural organizations and youth) in the broader perspective of cultural transformation in Central Asia. MNG 360° БАЙГАЛИЙН УРЛАГ МОНГОЛ is an Ulaanbaatar based independent, non-profit, contemporary art organization (NGO) with the purpose of raising awareness for issues as sustainability, nomadic culture, ecological decentralization and democracy by means of contemporary art as an impulse generator for civil society in Mongolia, with a main mission of promoting and realizing the Biennial Land Art Mongolia. Land Art Mongolia was initiated in 2006 on the occasion of a Land Art Symposium in Bor Undur, Gobi (a small village near Sianshand, a daytrip from Ulaanbaatar) and has been hosted in various locations of Mongolia. Since its first edition in 2010, the Biennial has taken place every two years in different regions of Mongolia. A fact that does not only pay tribute to the breath- taking landscapes of the country but refers as well to its nomadic tradition. This 1st Biennial, curated by the Indian Canadian art critic Robin Alexander Suri residing in China, took place in Baga Gazriin Chulu, Dundgobi. (a natural reserve near Mandalgovi about an 8 hour drive south of Ulaanbaatar). Two years later, in 2012, artists from 16 nations (10 artists from DAC countries) participated in the 2nd LAM Biennial in Ikh Gazriin Chuluu, under the title Art & Politics. Curators: Fumio Nanjo (Director Mori Art Museum Tokyo) and Berlin based independent curator Anna Brietzke. 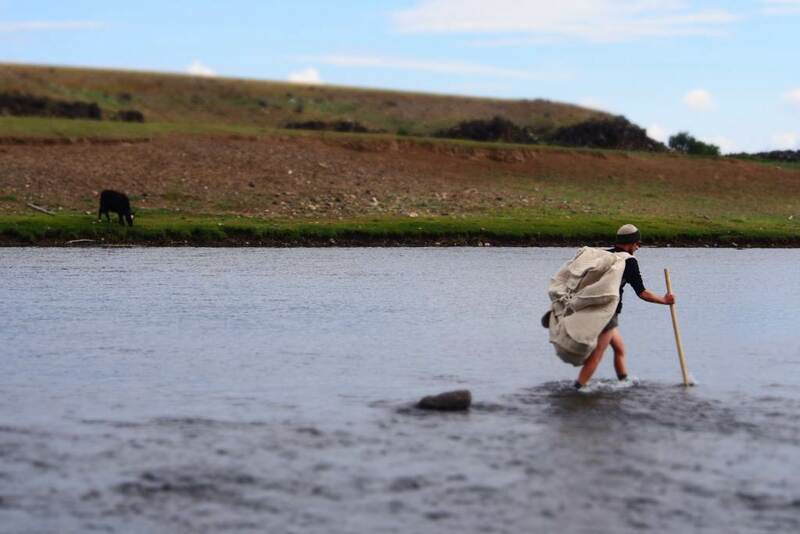 The 3rd Biennial, which took place in August 2014, focused on the theme Men & Animals, with 24 artists from 14 different countries (9 participating artists from DAC countries) gathering in Orkhon Valley (300 km West of Ulaanbaatar). This venue was completed by an exhibition at the UMA Art Gallery in Ulaanbaatar, curated by Vera Tollmann (Berlin), with texts and an essay by Brian Holmes (lecturer & editor at Documenta 2013). It became a highly respected international event. Under the title of “Catching the Axix – in between the sky and the earth”, the 4th Biennial will take place in Daringanga, southeast Gobi, summer 2016. In the past, each Biennial venue was accompanied by a public symposium at the Academy of Science, bringing together different speakers both Mongolian and international, and by an exhibition at the National Mongolian Modern Art Gallery or similar, both in Ulaanbaatar. They were accompanied by a catalogue, available in print and online, with a full documentation of each artistic work. 2015 LAM hosted a presentation at Palazzo Zorzi (Palazzo di UNESCO at Venezia) during the opening of the 56th Venice Biennial. LAM art award holder Ganzug Sedbazar was invited to do a performance; the art prize was awarded for the first time 2014 for excellent work in Land Art. The performance was completed by a multimedia presentation realized with works from the three prior Biennials and by an introduction to the project Мөрөн | The Mountain.